George Harrison would be 66 years old today. George was always my favourite Beatle. Go ahead, disagree if you like; you can prefer Paul, or John. I’ve always liked George — with the Beatles, with the Traveling Wilburys, with the various friends he often performed with, or just by himself. George Harrison died of cancer in late November of 2001. But today we can celebrate his birth. And his music. As I have aged, and my musical tastes have widened, I have gained more appreciation of the other two members of the Beatles. 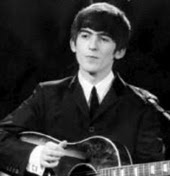 George Harrison is widely considered within the music industry to be one of the great unsung guitarists of his time. George was always my favorite, too, and post-Beatles definitely. I like them all. My father was greatly affected by John's murder. He will STILL go on about how senseless it was. I disagree! Your favorite Beatle is Ringo! Couldn't resist. I think George might be my favorite, too.